The Petten reactor is to restart on 16 February 2009, many weeks after it went offline. The unit is one of a few reactors that maintain global medical isotope supplies. 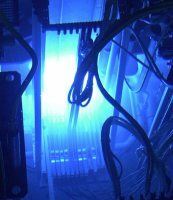 Traces of gas bubbles were detected in the primary cooling system of the High Flux Reactor (HFR) at Petten in the Netherlands during the course of an August inspection. NRG described the finding as an 'anomaly' at the time, and today explained that the bubbles were caused by corrosion of the pipework of the primary cooling system. On 21st August, NRG decided not to start up the reactor at the end of the month-long major maintenance and inspection program. One section of primary pipework needs to be repaired, and a plan to do this has been developed by Areva and its subsidiary Uddcombe Engineering. A sleeve will be inserted within the corroded section and clamped in place using remote handling equipment. The repair is difficult because the pipework is contained in concrete. "This complicates the repair and demands rigorous preparation," NRG said. Today, NRG announced the unit is expected to restart on 16 February next year. HFR is the source of 30-40% of the world's medical isotopes, which are used in a variety of imaging procedures for diagnosis as well as radiotherapy. A key product from HFR is molybdenum-99, which decays into technetium-99m - used for medical imaging. Molybdenum-99 has a half-life of just 66 hours, so deliveries to hospitals need to be regular and frequent. Separate from problems at HFR, an isotope production reactor in Belgium is not currently operating while a processing plant in the same country has been offline since the inadvertant release of some iodine-131. Although production reactors in South Africa and Canada are operating normally, the loss of HFR is significant for global supply. Hospitals worldwide have had to schedule nuclear medicine procedures carefully in order to maintain service during the recent weeks of reduced supply. NRG said today that one arrangement used to alleviate the shortage was to expose isotope production 'targets' to neutron bombardment at the Osiris reactor in France instead of at HFR. The alternative targets were processed at a Petten facility, owned by Covidien, which would normally process targets from HFR. "In this way for the past two weeks, the only available reactor in Europe with production capacity has been coupled to the only available production line in Europe at the time," said NRG. Two weeks ago, World Nuclear News revealed that the shortage had real implications for British hospitals after just one isotope shipment from continental Europe failed due to the Channel Tunnel fire. Transport managers found there was no other commercial option available for radioactive materials transport.